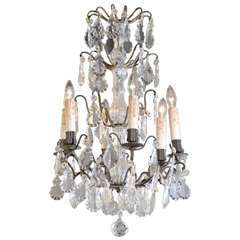 Small overgrown unique crystal chandelier, Mark Sturkenboom Dimensions: 45 x 30 x 30 cm Material: antique French chandelier, natural grown (white) crystal Edition: No. 3 / 25 unique pieces Crystal can also be in grey / black. This world is cluttered with stuff, how would the world look like a few thousand years from now? Overgrown is a series of chandeliers and candlesticks that appear to be relics from a desolate flooded world. Atelier Mark Sturkenboom designed a fluid which allows objects to grow crystals over a period of time. He reclaimed antique French chandeliers and created the perfect conditions to set a hyperevolution in motion. Every object grows out to be a unique piece. Mark Sturkenboom (Driebergen, 1983) is an artist that graduated with honors in 2012 at Artez Academy for the Arts in Arnhem/Netherlands. Since 2012 he works as a conceptual product designer/artist in his atelier in Utrecht. His work balances between art and design, he stretches the boundaries between art and design. He offers new viewpoints and rituals to deal with life. ‘My focus lies not on the appearance of things, but on what I call the deeper layers in the relation between an object and its owner. ‘I try to call forward a myriad of associations and stimulate our thinking about what counts to us in our lives. I examine the meaning of objects and products and set them free from their conventional and initial use.’ Sturkenboom reinterpretates products that are often intertwined with the themes love, time or has an inclination with a collective value perception. Engaging his work, you probably will need to start making ‘moral’ decisions. For instance his Ark, table clock, urn or vase are not just functional or only good looking. In their presence and while handling them they invite you to think about time, love passed or the possibility to free yourself from the burden of your possessions by destroying them. His work is exhibited and part of private collections worldwide, from New York to Shanghai, from Tokio to Amsterdam. 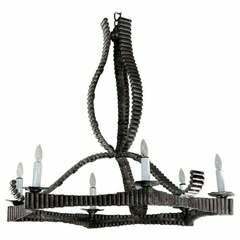 Large sculptural Brutalist chandelier in dark nickel finish, American, 1970s. 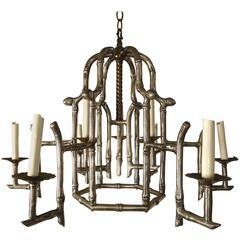 19th Century Iron and Crystal Chandelier from France- Circa 1890 Please Note This Item is an Antique and is One of a Kind.